I swear, I spend way to much time on the internet if my own mother is checking Facebook and deems no posts in 12 hours to signal death or serious injury on my part! Anyway, on the subject of spending too much time on the internet, thanks to my school blocking all non-essential websites (yet not Facebook for some reason, go figure), this week’s timewasters is a short one! Covered by a wide range of news outlets (did nothing else happen this week?? 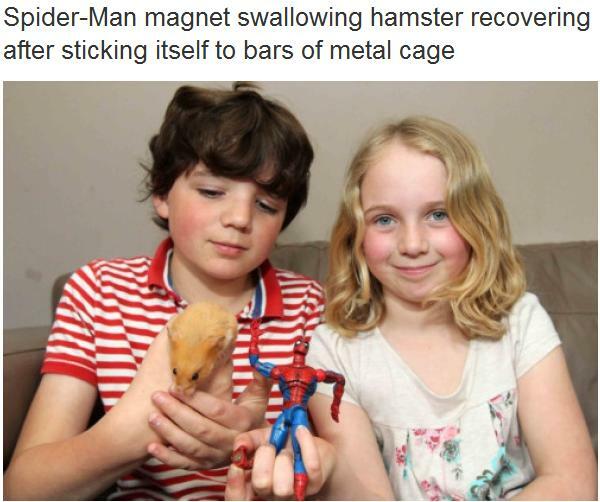 ), the story centers around a hamster named Smurf and a Spiderman toy with a magnet. Smurf ate the magnet, climbed about in his cage and then the magnet, doing what magnets do, stuck him to the bars like a pizza menu to a fridge. Hahahaha, could you imagine coming home you your pet dangling in midair…and then it all ending up on the news?! You can read all about his plight by Googling ‘Spiderman Hamster Magnet’ or by checking out the BBC Radio bit. I show my students a picture of ‘earmuffs’.